Are You a PaperCut MF Pro? 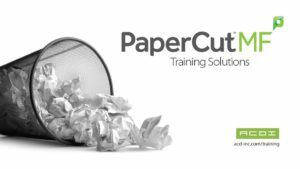 Learn Tips, Tricks & More at the next Technical Training, April 24 - 26 | Industry Analysts, Inc.
A 3-day course designed for those who are new to PaperCut or have some previous experience with installing, configuring, and troubleshooting the software. Learning objectives will focus on developing a complete understanding of an end-to-end PaperCut implementation and introducing advanced PaperCut techniques that will prepare trainees to attend a future Advanced Technical Training. Best For: System engineers, pre-sales engineers, solutions consultants or any other technical staff that want an in-depth view into PaperCut MF from installation to configuration. This entry was posted in ACDI and tagged ACDI, PaperCut MF Pro by IA Staff. Bookmark the permalink.